On November 4, 2016, at age 72, Ben Mathews launched an online blog to help people with disabilities find solutions to everyday problems. Ben has muscular dystrophy and is confined to a wheelchair and a ventilator. His blog is a way to share with others the lessons of his experience. When he was in his 20s, Ben was diagnosed with the condition that would eventually take away his control of his muscles. But Ben’s type of muscular dystrophy progressed very slowly allowing time for him, with the help of his wife and friends, to find ways around the obstacles he faced. Many people who find themselves confined to wheelchairs or ventilators don’t get that same luxury of time. They can suddenly face a pile of roadblocks so daunting, getting to something of a normal life can appear utterly impossible. Ben is a writer, graphic designer, and web developer, so a blog came naturally to him. He pulled from nearly five decades of experience to share stories and resources that might help others facing new physical limitations. Some posts describe simple practical solutions that make life easier – like crafting a plastic stand with Velcro to keep his phone from falling off his lap. 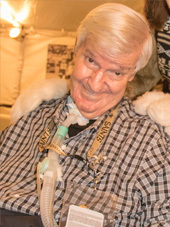 But he has written on wide range of topics including life on a ventilator, living independently, using speech recognition software, and even getting a job. “Being in a wheelchair and being on a ventilator seem terrible,” Ben says. “It really is… it’s not great. But I want to tell you I have a much richer life because of my condition than I would have without it.” He’s been able to help people, and so many people have helped him. The realization of it all brings a “rich moment,” he says. The Peoples Health Champions program was created with the New Orleans Saints to recognize “Excellence through Experience” – to illustrate how age and experience give people a unique capacity to accomplish great things. Remember when 65 was old – when it was time to do less instead of more and better? It never really was that time. That was a myth – a myth that Ben Mathews has helped shatter. Ben Mathews … Peoples Health Champion. Visit datsanidea.com to see and share the knowledge Ben provides for people with disabilities.